The Navy has developed a Tactical Submarine Evolution Plan that looks at rapidly inserting capability upgrades into the Virginia-class attack submarine mid-contract and considers long-term undersea warfare priorities such as converting the Columbia-class ballistic missile submarine (SSBN) production line into a guided-missile submarine (SSGN) line in the late 2030s. The Navy’s Undersea Warfare Directorate (OPNAV N97) started the plan under previous director Vice Adm. Bill Merz, who now serves as the deputy chief of naval operations for warfare systems (OPNAV N9), and has been continued under current acting director Brian Howes. Howes, speaking Thursday at the Naval Submarine League’s annual symposium, said the next iteration of the Virginia-class submarine program, Block V, begins in Fiscal Year 2019, but currently if a new capability were developed after the design is complete, it would have to wait to be fielded in the next Block VI in FY 2023. “We need to have the opportunity to have mid-block insertions into our platforms,” he said. Though headed by OPNAV N97, the Program Executive Office for Submarines and the Virginia class program office are involved and wholeheartedly onboard. “There’s a continuous conveyor belt running, and developers who have an idea get on that conveyor belt, and if they can develop it and achieve the requisite reliability and producibility by the time that conveyor belt comes around for production then they can get into the next version … that’s going to be fielded. If they miss that one, then the conveyor belt goes back around again and they get another shot at it in two years,” PEO Subs Rear Adm. Michael Jabaley said at the conference of SWFTS and the Acoustics Rapid Commercial-off-the-shelf Insertion (ARCI) program that does the same thing on the computer processor side. This concept somewhat blurs the lines of future Blocks VI and VII and the eventual move to the SSN(X) attack sub program. The Virginia class has been upgraded in each block to improve manufacturing, reduce lifecycle costs, and add a mid-body Virginia Payload Module with additional missile tubes. Though two more iterations of upgrades are planned, the submarine community is finding they’re running out of space to add more capability. 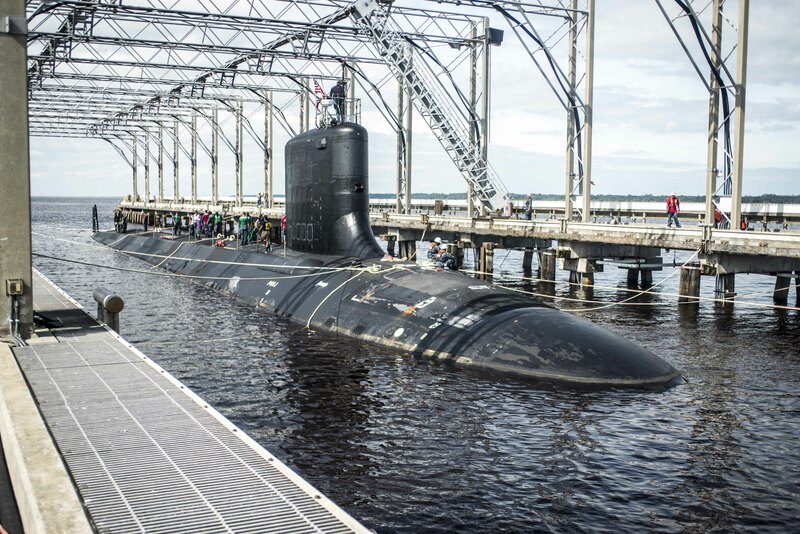 Jabaley said the Virginia program had already had its acquisition program baseline extended from 30 boats to the current 48, which the program is scheduled to reach in FY 2033 – but will likely hit even sooner, as the Navy looks at speeding up Virginia-class submarine construction. The TSEP doesn’t just look at adding the capability to the Virginia-class subs and its successor SSN(X). It also looks at the SSGN concept: the fleet’s four SSGNs are set to decommission by 2028, and while the Virginia Payload Module and its extra missile tubes are meant to mitigate the loss, they don’t make up for the full strike capability – nor the special operations forces support – the fleet will lose at the end of the SSGNs’ life. 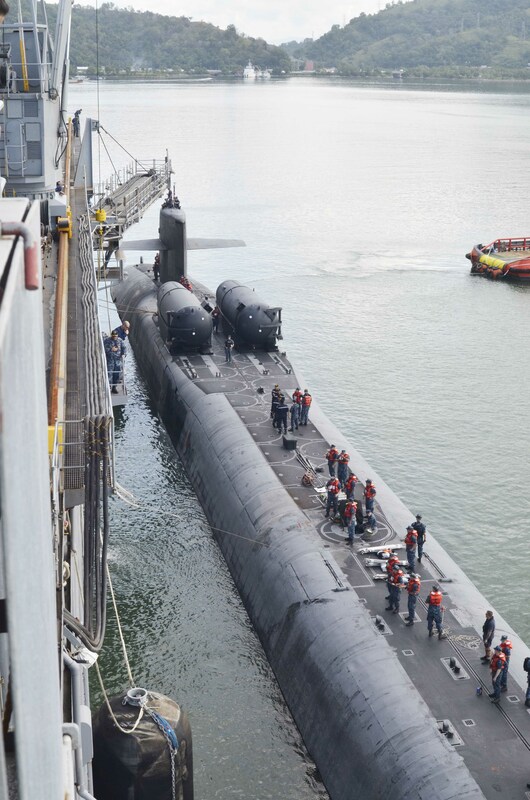 The guided-missile submarine USS Ohio (SSGN 726) moors alongside the submarine tender USS Emory S. Land (AS 39) in November 2015. US Navy photo. To address that firepower gap, the TSEP looks at the possibility of using the Columbia-class SSBN design and production line to flow into an SSGN production line in the mid-2030s. General Dynamics’ Electric Boat and Huntington Ingalls’ Newport News Shipbuilding will build a dozen SSBNs – one in 2021, one in 2024, and then one a year in 2026 through 2035 – and talks are underway about keeping that production line warm by building more guided-missile subs. “There is value in keeping two product lines going,” Howes said of the large SSBNs and SSGNs and the smaller SSN and SSN(X) attack subs. On top of the TSEP concept, the Navy has also worked on an Alternate Futures Study, Naval Reactors director Adm. Frank Caldwell said Nov. 1 at the conference. The submarine community has worked with the Naval War College to look at future demands on the force, where it might be asked to operate, doing what missions, against which adversaries and with which allies, and more. “We will use the Alternate Futures Study to inform our decision regarding future capabilities and operational requirements, not only for the next platform but for other investments in the undersea domain,” Caldwell said, noting the study doesn’t point to a single future but rather a range of 2040 potential futures for which the force can plan.